When I first chose to use the mirror from our old bedroom set in my design area downstairs, my husband asked if I wanted it framed. I told him I was fine without a frame....that was May of 2012. I have recently exercised my prerogative as a woman to change my mind and told my husband that I had been looking for a frame for my mirror. Hey...it's been over two years; I think I did good! Do you know how expensive large frames are? It's absolutely crazy. Fortunately, my husband is very skilled when it comes to woodworking so he kindly offered to help build a 33 x 37 frame for me. After a quick trip to Lowe's (I had done a pre-scouting trip) for the materials, he went to work. He cut a base frame from wood and then glued the decorative moulding that I chose onto the base. You'll see these cute little grooves/doughnuts he took the time to place into each of the four corners to help keep them secure and square....a new tool purchase he recently made. As with any of his projects, there was minor cussing; this one was a result of the mirror not being square. Very disconcerting when the carpenter cuts his boards square. None-the-less, he was able to put this baby together for me in just two days time! That includes the painting. I've found he's a much better spray painter than I am, so I gladly deferred to him on that as well. I've asked him to coach me, since my full blast at close range technique has resulted in streaks and drips on just about every one of my projects. Go figure! I added (yes., I did this step after watching the pro) a light coat of silver glitter spray over the blue which looks really sweet....then finally, a clear top coat was added. As you've seen through my posts, my room is filled with color so I thought the unique shade of blue would work just fine. To hang the mirror, my husband consulted with his brother on options. Shout out to Tom who came up with a truly creative solution to use carpet trim ( you know...the edging that covers the carpet when it transitions to another flooring). One strip was screwed into the wall and the other into the back of the frame; the frame just slides into the groove on the wall. Very clever! Well....I'm thrilled! I was looking for a substantial frame with character and that's just what I got! 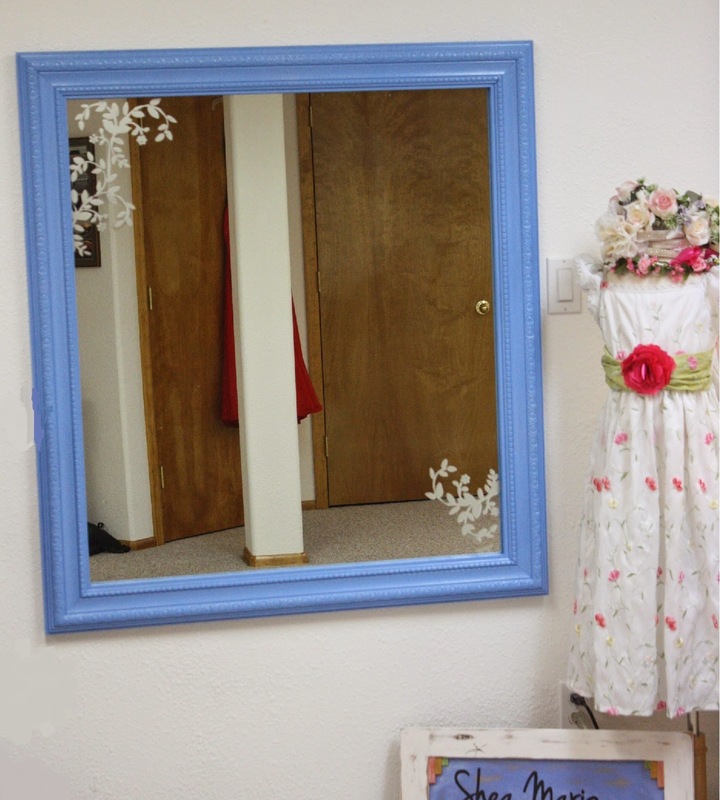 The frame truly adds so much to the overall look of the mirror....and what a great focal point for the room too! I hope I'm not overdoing it with recipes, but along with pattern-making, sewing and crafting, I also love to cook.....as I mentioned on my FB page, I'm on a mission to cook my way through the 100's of recipes I've clipped out of magazines, newspapers and/or printed from websites over the years. I plan to try them all and then make a determination as to whether it's a "keeper" or a "goner". Those I'm keeping, I'm writing them down on a recipe card and putting them in the book I purchased years ago. With any luck, I may need to purchase another book and have a Volume I and Volume II instead of unsightly clippings held together with a chip clip. sheeeeeshh....so unlike me! Anyway....onward to this particular recipe, which by the way is a definite KEEPER. Oh my goodness, what a tasty recipe. Now I served this salsa with a blackened mahi-mahi which was absolutely delicious.......but, I could also see using the salsa with chicken, fish tacos, or served with just chips for an appetizer. To blacken the mahi-mahi, I simply coated the fish with a blackening seasoning (I used Emeril's) and then cooked them in a pan with approximately 2 Tbsp. olive oil. It takes about 4 minutes on each side. I served it with rice pilaf, steamed broccoli and fresh baked bread. So good!! Look at all those luscious chunks of fresh fruit and vegetables...it's making my mouth water just looking at it. I am so excited to share this with you...and the best treat for me is I just stumbled upon it at Lowe's. I have been bothered with a window I have in the basement. You see, it is in the area where I have my clients change clothes. I've had a decorative screen for them to step behind, but it still bothered me. Really since my shop is in the basement, it's really not possible to see into the window....but it was a psychological thing for me; I want my clients to feel they have privacy. Plus, being a basement window it has the ugly window well too. The reason it's taken me so long to figure out what to do with it is I like the bit of light it provides, so I really wasn't too thrilled with putting up curtains or something else that was going to make it darker. So, I did nothing.....until NOW! This little discovery is the perfect solution actually. It adds privacy, still lets in light and camouflages the window well. EUREKA!! The product is made by Gila. As you can see from their website, there are all sorts of added bonuses with the product like UV ray reduction, and energy saving benefits. They had several to choose from at Lowe's....I opted for the frosted glass look, although there were a couple others that were really pretty, including two that resembled stained glass. I have to tell you, I was a bit intimidated with the whole thing....but, I just followed along with the step-by-step directions and it went really well actually. I purchased one package of the film and a bottle of the application solution. I did not buy the other items they sold, which was the trimmer (I figured I could use an x-acto knife and I was right....it worked just fine). I was able to handle this window on my own, especially since it was in two separate panels...but I could see if it was a wider window, a second pair of hands would be really helpful. I know there are many folks who have a garage window or bathroom window that present the same challenges I just described. I would say this product could be the solution they've been looking for. The packaging says it takes several days to fully "cure", but I'm pleased with how easily it went up, how well it adhered and I don't have any air bubbles or slippage. I do have a lot of the solution and a fair amount of the film leftover. Hhhhhmmmmm......I just may have to do the other window on the other side of the room. I have to admit I've never been a real scone fan....those I've eaten have seemed dry to me. But, I love me a snickerdoodle for sure.....so why not give the scone a second chance, especially if there's a way for it to taste like a snickerdoodle right? Oh my gosh....these are absolutely fantabulous!! Thank goodness the recipe only make 8 of these little suckers, because they are soooooo good, they will definitely set you back a few calories. I need to thank Sweet Pea's Kitchen for the recipe. I did notice that she adapted her recipe from Craving Comfort. You'll notice mine aren't quite as tall....I'll have to try another batch because I'm not sure if it's the altitude or .... I wish I would have read Craving Comfort's instructions before I baked them, because her instruction about having the dough 3/4" high would have probably helped. I know now my circle was too large. So that's the first adjustment I'm going to make. Also, if you're like me and don't have a food processor, don't worry.....I used my electric mixer with the bread blade attachment and it worked just fine. I did add 1/4 tsp. of vanilla extract to the spiced glaze, but other than that, I didn't make any other adjustments. These babies are scrumptious! So moist and flavorful, unlike any other scone I've tasted. You have to try these....really!, and it you think they're going to be difficult, with a lot of kneading and other bread baking techniques, you're in for a pleasant surprise. They are super simple. I'm giving myself an "A" for originality; an "A" for flavor; but a "B" for homemade goodness. You see, I went about as easy as you possibly can by using some pre-made items I spotted on the grocery store shelf. It was totally tasty though! There are three items you need to purchase at the store. Two packages of Martha White lemon poppy seed muffin mix and one jar of the King Soopers private selection California lemon fruit filling. Follow the directions on the package and be sure if you are in high altitude to add the additional flour. Fill the prepared pan ( I used cooking spray) with 3/4 of the batter. Spoon a layer of the lemon filling lengthwise down the center of the pan. I left some room on each side of the pan; really concentrating on making a nice yellow stripe down the middle. I would say I probably used about 1/2 cup of lemon filling. Pour the remaining batter over the top of the filling. I only placed 1/2 the batter in the bottom of the pan on my first attempt and you'll notice that the filling sinks some while baking....that's why I'm recommending 3/4 in the bottom. Bake in a 350 degree oven for approximately 45 minutes. When cool drizzle a powder sugar glaze over the top of the bread (powder sugar and milk). I love the extra lemon flavor and the ooey, gooey goodness in the center. I've enjoyed it at breakfast and at dinner with a salad. My husband just had a slice with ice cream on top! However, you try it ..... just do.....it's yummy!